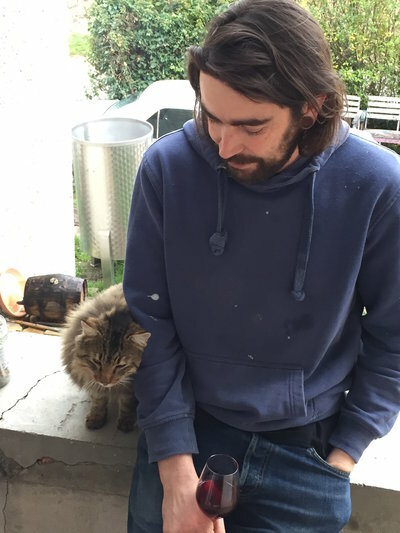 Sylvère has been making his own wines since 2012, taking over the vines of his grandparents in the hamlet of Blacé in the heart of the Beaujolais. Before creating his own wines, Sylvère worked for renown winemakers Jean-Claude Lapalu in the Beaujolais and also for Dominique Belluard in Savoie. In recent years, the Beaujolais has become one of the most exciting wine producing regions in France. Many talented winemakers, Sylvère included, are rebuilding the reputation that had been tarnished by the mass produced Beaujolais Nouveaus which are shipped around the world in November. Due to a diverse terroir, it is incredible how the Gamay grape can taste totally different from one excellent producer to the next! Beaujolais wines of this quality, finesse, and structure can rarely be found outside of France. Sylvère's wines- red, white, and rose- are quickly becoming amongst the most talked about Beaujolais wines in Paris' natural wine bar scene. We consider ourselves very fortunate and privileged to bring his exceptional wines to you.